A report by Nielsen notes that US smartphone use has increased from 18 percent of all US mobiles in Q3 2009 to 44 percent in the same quarter this year. Since it introduced the iPhone in 2007, Apple has bet exclusively on smartphones, resisting the advice of analysts and pundits who recommended a "iPhone nano" to play in the so called "feature phone" market. The company's focus on smartphones has paid off. Two years ago, the most popular phone in the US was Motorola's RAZR V3; this year, Apple's iPhone 4 was the top selling phone of any type, despite being more than a year old by the time the US Mobile Insights report was compiled. More than half of users in the 18-24 and 25-34 age demographic now use smartphones, up from around a quarter of those who had one two years ago. 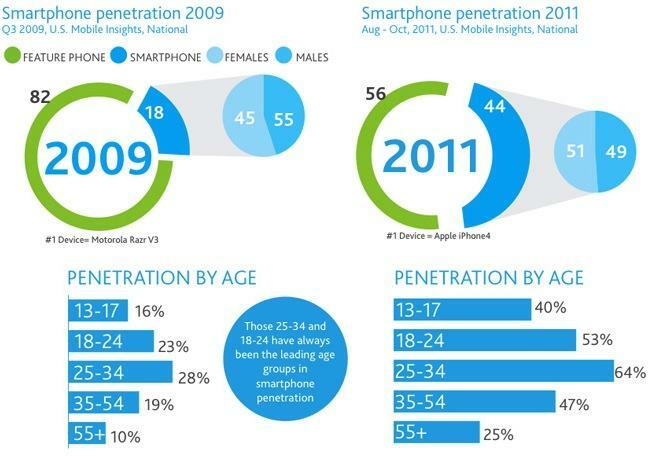 Among older and younger users, smartphone use has similarly more than doubled. Note that Nielsen's graphic (above) mistakenly presents the 2009 gender pie chart using the wrong colors. By manufacturer, Apple is by far the largest vendor of US postpaid smartphones, accounting for 28.6 percent of all subscribers. By platform, all vendors of smartphones using any version of Android combined accounted for 44.2 percent of the US market in the third quarter. Outside of Apple and Android, RIM's Blackberry accounted for 17 percent of subscribers, while Microsoft's obsolete Windows Mobile still claimed 5.3 percent of smartphone use. 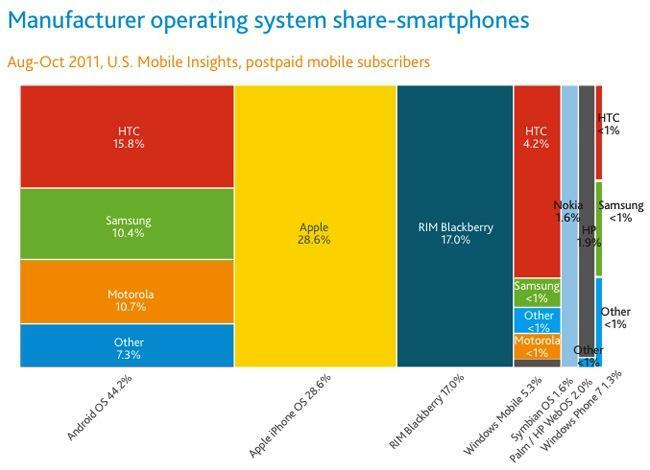 Microsoft's now year old Windows Phone 7 platform barely registered, with just 1.3 percent of the US market. That's a share smaller than even Nokia's terminated Symbian (which never had a significant US presence), which could still claim 1.6 percent share, and all users of HP's Palm webOS, which accounted for 2 percent of the market. Nielson says the majority of smartphone owners (62%) "have downloaded apps on their devices and games are the top application category used in the past 30 days." It added that 87 percent of app downloaders (those who have downloaded an app in the past 30 days) have also used deal-of-the-day websites like Groupon or Living Social. The report also notes that smartphone use of mobile Internet has grown 45 percent since 2010, and states that (surprise!) younger groups text the most. "In Q3, teens 13-17 sent and received the most text messages (an average of 3,417 each month)," the company states. Nielson compiles its data from monthly surveys of 300,000 consumers, as well as "device metering data from the iOS and Android smartphones of thousands of consumers who have volunteered to be a part of our research panel," and a detailed analysis of mobile phone bills for 65,000 volunteer users.